The latest versions of iTunes no longer default to creating an iTunes Library XML file, which was an iTunes file that allowed various other apps to interact easily with an iTunes library, and could also serve as a basis for rebuilding an iTunes library if that were ever needed. 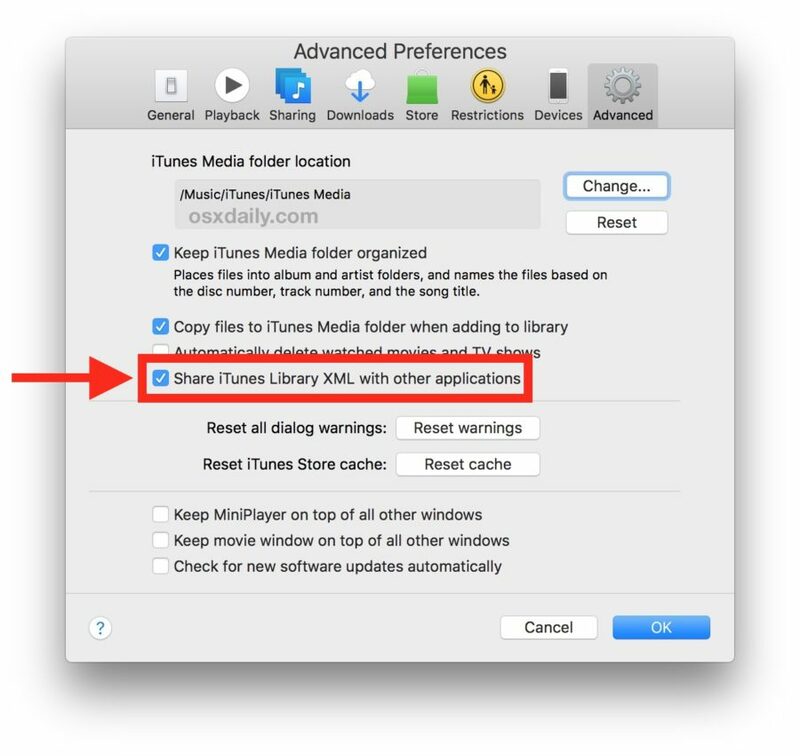 Despite “iTunes Music Library.xml” files no longer being created in iTunes on Mac OS or Windows by default, you can actually still generate an iTunes Library XML file if it is needed by another app or for some other purpose. Read on to learn how to create an iTunes Music Library.xml file in the latest versions of iTunes for MacOS or Windows. Simply setting that preference option should cause iTunes to generate an iTunes Music Library.XML file, which will appear in the default iTunes library directory on the Mac or Windows PC (the default will apply unless you moved the iTunes library manually to another location) as a file named “iTunes Library.xml” along with the various media folders and “iTunes Library.itl” files. What is iTunes Library XML file? Why does it matter? The iTunes Library XML file is basically a file that stores iTunes library information in a broadly readable XML file format, making it compatible with other apps for easier importing of media, and management of iTunes library data. Newer versions of iTunes no longer default to creating that XML file, and Apple says the file is not necessary for compatibility with some new apps interacting with iTunes. Presumably those apps now rely on the “iTunes Library.itl” file instead. The iTunes Library.xml file contains some, but not all, of the same information that’s stored in the iTunes Library.itl file. 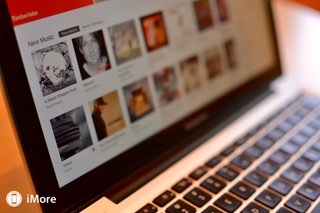 The purpose of the iTunes Library.xml file is to make your music and playlists available to other applications on your computer, such as iPhoto, Garageband, iMovie, and third-party software, in OS X Mountain Lion and earlier. These applications use this file to make it easier for you to add music from your iTunes library to your projects. By default, iTunes 12.2 and later doesn’t create an iTunes Library.xml. Thus, if you need that XML file and you’re on a newer version of iTunes, or you are using an older version of system software, or managing libraries with an older version of iTunes, or you are using an app that requires the iTunes Library.xml file for whatever reason, you will need to generate one yourself by toggling that setting switch within iTunes preferences. Most users won’t need to toggle this setting, or have anything to do with the iTunes Library XML file in general, though some people running prior software may have come across the file at some point when troubleshooting a problem like fixing a disappeared iTunes playlist or attempting to rebuild an iTunes music and media library, or even backing up or migrating a library to a different location. 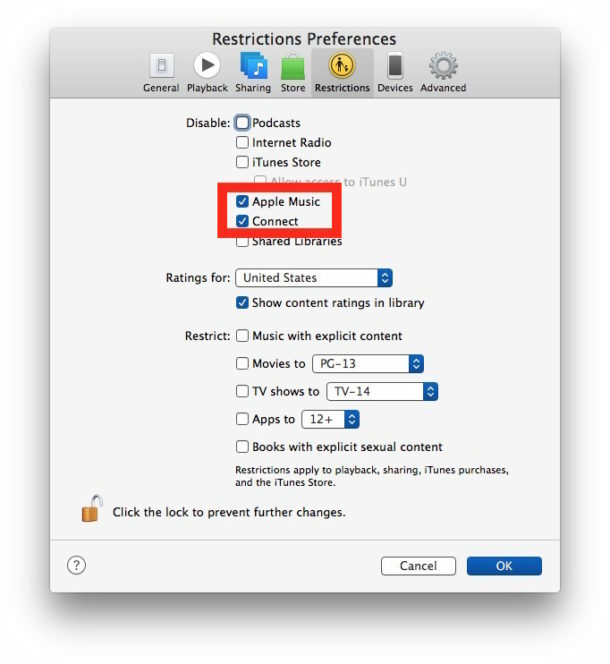 If you happen to browse through the iTunes Music Library XML file and find it incomplete, it’s possible that some music was either not found, not contained within the library, it was played in iTunes without adding it to the iTunes Library, or that some other issue occurred with the reference music data. Do you know of any particularly helpful or relevant tips relating to the iTunes Library.xml file? Do you know of another approach to generating a missing iTunes Library.xml file? Share your thoughts and experiences in the comments below! En af de smarte iCloud-funktioner er, at man i App Store kan finde en liste over alle de apps, man nogensinde har hentet til sin iPhone eller iPad. Det gør det nemt at hente apps, man har slettet ved en fejl, eller efter en gendannelse etc. Man kan også bruge funktionen til nemt at hente apps på andre enheder end der hvor der er købt. Eller man kan bare bruge skyen som lager for sine apps, hvis ikke man har plads på iPhonen. Så henter man en app, når man skal bruge den, og sletter den igen bagefter. Listen findes i App Store under Opdateringer > Købt. Bruger man familiedeling, vil man ud over sine egne køb kunne se de andre familiemedlemmers køb også. Et af problemerne ved denne liste over apps er, at den er altomfattende. Revl og krat er på listen. Også ting man har hentet ved en fejl, apps man kun har brugt én gang fordi de var for dårlige og så videre. Det gør straks listen knap så anvendelig. I stedet for at være et sky-bibliotek over brugbare apps, man bare ikke har på iPhonen eller iPaden lige nu, er det en historisk liste, der nemt drukner i ligegyldige ting. Heldigvis findes der råd for dette. Du kan nemlig manuelt fjerne apps fra iCloud-listen. Fidusen er, at bruge den universelle gestikulation til at slette ting i iOS’s tabeller. Du fører simpelthen bare fingeren fra højre mod venstre på appen i listen. Når du gør det, kommer der en rød knap frem, hvor der står “Skjul”. Den trykker du på, og emnet bliver fjernet fra listen. Vær opmærksom på, at det ikke altid fungerer lige godt. Der er flere der oplever, at skjulte apps dukker på på listen igen, uanset hvor mange gange man forsøget at skjule dem. Det er ikke fordi du gør noget forkert, men fordi der er en fejl hos Apple. Tricket virker også til ebøger, magasiner i Bladkiosk og apps købt i Mac App Store. Du kan også gøre det via iTunes på computeren i stedet for på iPhonen. If your Mac’s hard drive is getting full, you can move your entire iTunes library to an external hard drive to free up space. After decades of digital music, it’s not unlikely if you’ve amassed quite the collection of music on your computer’s hard drive. If your iTunes library is taking up too much space, you can move it off of your local drive and onto an external hard drive without breaking your music collection. You can also transfer your entire iTunes library from one computer to another if you are migrating to a new Mac. Before making major changes to your computer, it’s always a good idea to back up your data: The best way to back up your Mac is with a Time Machine routine in place, but you can choose an alternate backup option that’s right for you. Over time, it’s easy for your music, movies, apps, and other iTunes content to end up stored in various places throughout your computer’s hard drive. To ensure that you copy everything from iTunes over to an external hard drive, you should first consolidate your library. Even if you think your library has all your information consolidated already, it can’t hurt to do a manual check before moving any data. Launch iTunes on your Mac. Click File in the upper left corner of your Mac’s screen. Hover your cursor over Library in the dropdown menu. Select Organize Library from the secondary menu. Tick the box for Consolidate Files in the window that appears. This process makes a copy of all files in the iTunes media folder, and leaves the original files in their current location. Connect your external hard drive to your computer using a USB cable. Click on Finder to open a Finder window. Select your Mac’s hard drive. Click on the Music folder. Select iTunes and drag it to the external hard drive. Click Authenticate when prompted to give permission to move the iTunes folder. This process could take upwards of an hour or two, depending on how much data stored in your iTunes library. Once you’ve transferred a copy of your iTunes library onto an external hard drive, you will need to set a new path for the iTunes app by redirecting it to search the external hard drive for content, rather than your local drive. Launch iTunes and hold down the Option Key at the same time. Click on Choose Library when the window appears. Select your external hard drive under Devices in the Finder sidebar. Note: Until you delete the iTunes file on your local hard drive, you can switch which libraries iTunes uses by launching the app and holding down the Option key at the same time. 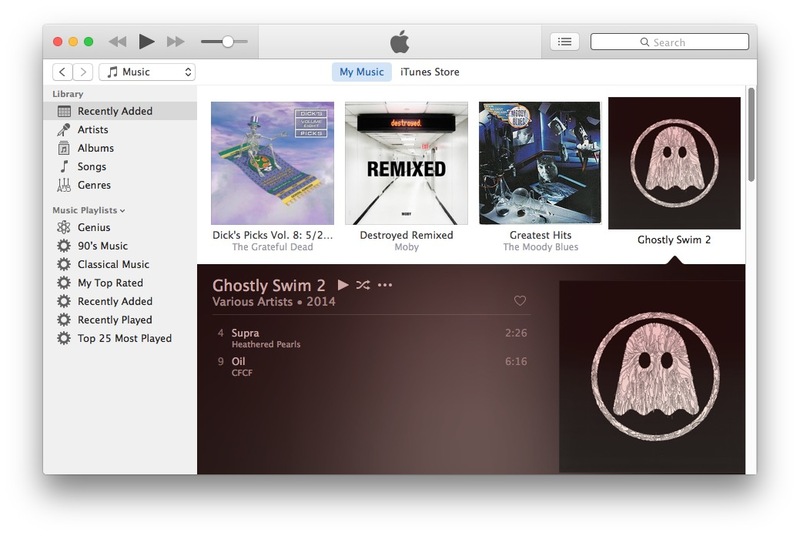 If you performed the first three steps correctly, when you open iTunes, it should look the same as it did before. You can double-check to make sure the migration worked by checking the info of any content. Select a song, podcast, movie, app, or other content. Right-click or Control-click on the song. Select Get info from the drop down menu. Click on the File tab in the info window. 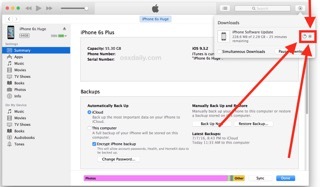 Once you have transferred a copy of your iTunes library onto an external hard drive and redirected iTunes to the new location, you can delete the iTunes folder on your local hard drive, freeing up space on your Mac. Note: If you are making a copy to transfer to a new computer, you don’t need to perform step 5 unless you want to remove your iTunes library from the old computer. Select iTunes and drag it to the trash. Make sure your external hard drive is connected to your Mac when you launch iTunes from now on. Otherwise, iTunes won’t be able to find the files. If that happens, quit iTunes, connect your external hard drive to your computer, and reopen iTunes. Once you have your iTunes library on an external hard drive, you can relocate it to a new Mac. 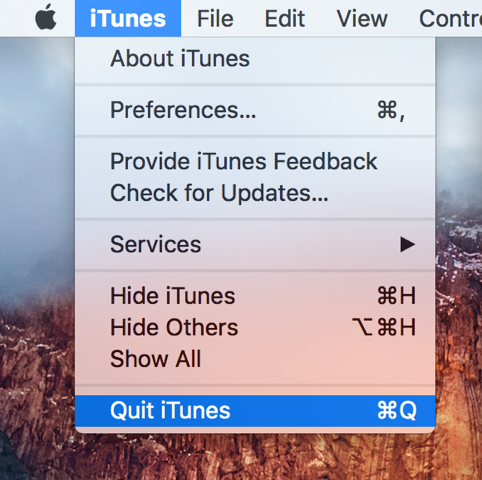 Quit iTunes on your new Mac. Connect your external hard drive to your new Mac using a USB cable. Open the external hard drive once it appears on your new Mac’s screen. Click on Finder on your new Mac to open a Finder window. Select your new Mac’s hard drive. 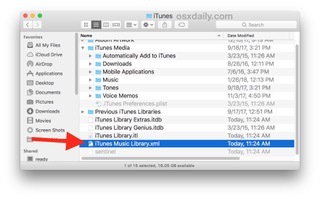 Drag the iTunes folder from your external hard drive into the Music folder on your new Mac. Select your local hard drive under Devices in the Finder sidebar. Do you have any questions or issues with moving your iTunes library onto an external hard drive or onto a new Mac? Let us know in the comments and we’ll help you out. 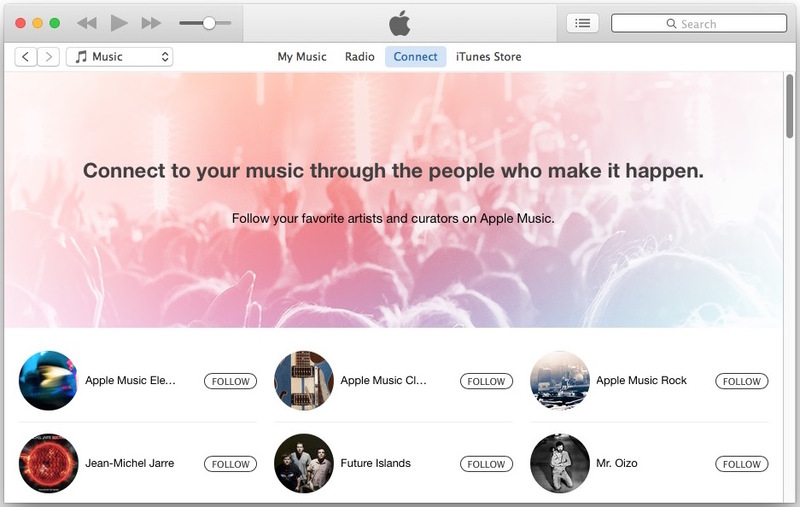 If you don’t use the Apple Music subscription service and you don’t have a need for the “Connect” tab in iTunes, you’ll probably find it helpful to know that you can clean up the interface a bit by disabling Apple Music and completely hiding the associated Connect tab and Radio tab in the new versions of iTunes. The result is a much simpler iTunes interface, and you won’t accidentally click on “Connect” or “Radio” any longer to be fed pop-ups about subscribing to a service. Instead, you’ll have iTunes with only your music, and only the iTunes Store, a bit like it was before all the recent changes made to the app, and before the introduction of Apple Music. This is one of several interface adjustments available in the latest iTunes release, though a bit like using the new sidebar for selecting iOS devices, it’s not necessarily obvious. By the way, you can also hide Apple Music on the iPhone and iPad, and earlier versions of iTunes too, but the new version of iTunes changed the location, and it allows you to go further and completely disable Apple Music and hide just about everything related to the service. This si particularly nice for those who don’t have an interest in Beats Radio and the related subscription music service offering from Apple. Of course if you use Apple Music and are a subscriber, you won’t want to do this, though it can be undone rather easily just by unchecking the preference boxes again. Thanks to Lifehacker for the nice discovery. Ooh, thank you for this tip! That is nicer. No, you can turn off Apple Music but the Music app remains as a giant advertisement and hustle for the Apple Music Beats by Dr Dre service that nobody wants unless you’re 13 years old. What would be smart for Apple to combine the iCloud fee, which should be free with an iPhone, with the Apple Music fee. At least we’d get some value-add for the $9 monthly fee you have to throw at Apple to be able to BACKUP YOUR IPHONE to iCloud without constant failures or error messages. Oh how I love this platform, nickel and dimed constantly for everything AND paying top dollar for hardware! They only nickel and dime you if you let them. I don’t have a paid Apple Music or iCloud subscription. Even so, I have more music than I can possibly listen to in a month for 24 hours a day, and I can back up my iPhone for free right on my very own computer. Can anyone show me to get rid of this worthless piece of garbage known as iTunes 12.4? The iPhone tab does not show unless you connect the device? Then, how are you suppose to sync over wifi? © 2016 OS X Daily. All Rights Reserved. Reproduction without explicit permission is prohibited. When you connect an iPhone or iPad to a computer with iTunes and an iOS software update is available, you will be notified with a pop-up that tells you a new version of iOS is available and asks if you want to update to the new version of iOS system software. 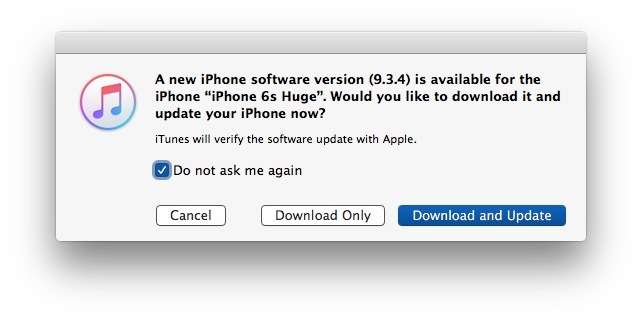 Additionally, if you click on the “Check for Update” button in iTunes when an iPhone, iPad, or iPod touch is connected, the same iOS software update process begins and the software will download and attempt to install. 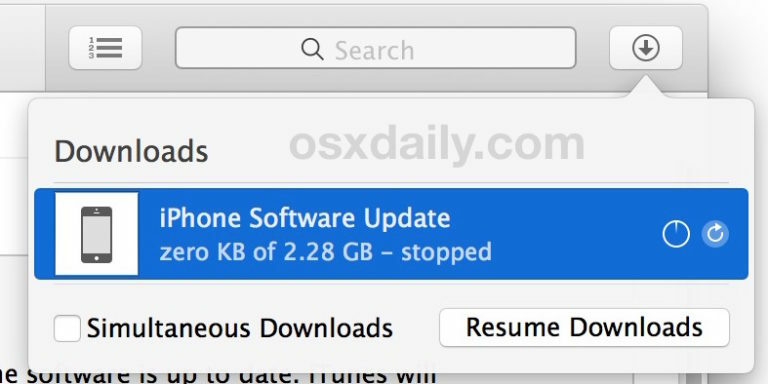 If you have chosen to accept an iOS software update in iTunes that you immediately realize you do not want to actually install, you can stop the iOS update process in iTunes by intervening quickly on a Mac or Windows PC. Speed is important, if you hesitate too long after pressing the update buttons in iTunes then it is quickly too late (depending on the side of the update download) and you’ll need to just let the update complete installation, possibly considering a downgrade. Note this actually stops iTunes from downloading the update and proceeding with the install, it doesn’t just stop the iOS update notification like what is available from on the device. If the progress bar of the iOS software update in iTunes changes to “stopped” you know you were successful in stopping the download and update process from going any further. Then you can simply select the item in the downloads list and hit the “Delete” key to remove it. The process can be repeated the next time an update is accidentally starting to download, but it always requires quick action. You must move quick because some software updates are quite small and with a fast internet connection the iOS update will quickly download and start trying to install. Once the update is installing itself, you need to let it finish because trying to intervene mid-update is a recipe for making the iPhone, iPad, or iPod touch useless and require a full restore. Some versions of iOS can be downgraded after the fact, so that would be the next approach if you accidentally installed an update you didn’t want, you can learn more about downgrading system software here. If you want to keep iTunes from checking for the same iOS update you just stopped, you need to ignore the update. The easiest way to do that is when the pop-up appears in iTunes, choose the “Do not ask me again” option checkbox and do not choose to download or install it. This obviously requires iTunes, and at the moment there is no way to ignore or end iOS software updates from happening on the device itself directly in iOS. Users can stop the iOS software update notifications on an iPhone, iPad, or iPod touch but the iOS update will attempt to continue to download itself to the device and harangue the user to install unless some preventative measures are taken. Perhaps a future version of iOS will offer an ability to completely ignore an iOS software update directly on the device, but in the meantime the only way to accomplish this is when the device is connected to a computer with iTunes. Those who use iTunes on a regular basis to keep their iOS devices in sync with one another are probably familiar with the problems that can arise from using the software, whether it’s on a Mac or a PC. If you’re having problems while trying to sync or back up your iOS devices, the problem could very much be with your computer’s Lockdown folder, and resetting it could resolve the problem. 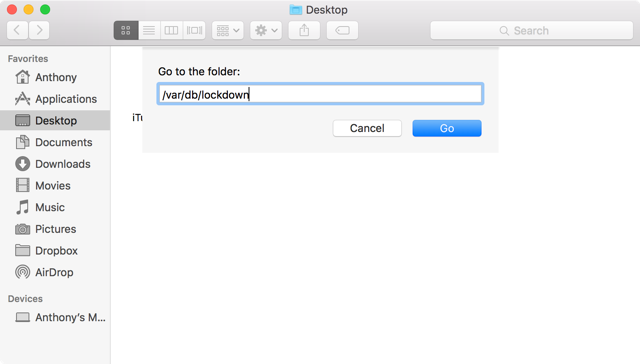 In this tutorial, we’ll show you how to reset your iTunes Lockdown folder. 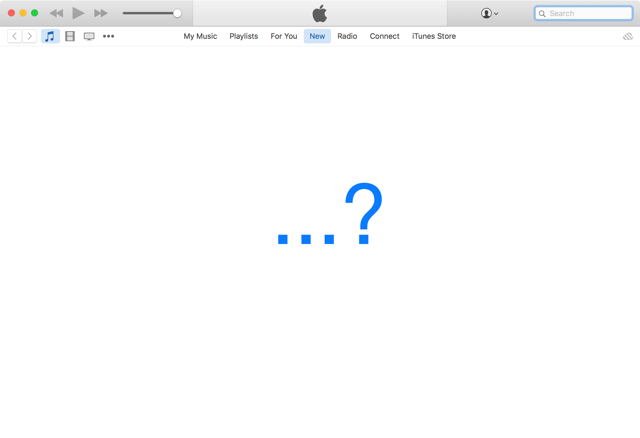 You may want to reset your iTunes Lockdown folder if you’re experiencing iTunes problems. To do that, you’ll want to follow the steps below. 1) Remove all iOS devices from your computer if they are attached with their sync cables. 2) Quit iTunes completely so it is not running in the background by going to iTunes > Quit iTunes in the Menu Bar. 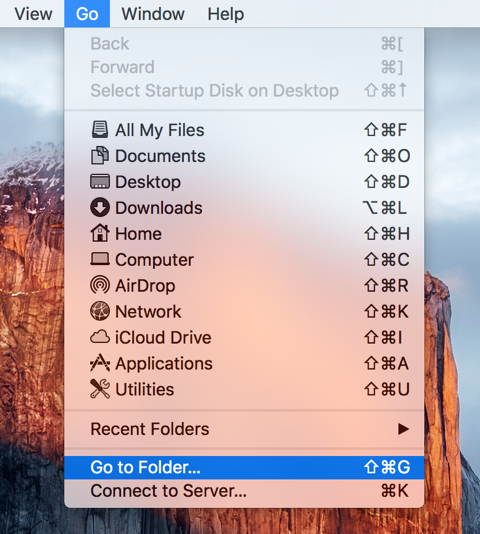 3) Open a Finder window so that Finder is in the foreground, and then go to Go > Go to Folder… in the Menu Bar. 4) In the text field that appears, enter /var/db/lockdown and then press the Return key on your keyboard. 5) Once you get into the Lockdown folder, you will see a number of alphanumerically-named files. Select all of them and move them to the Trash. 6) Empty the Trash to delete those files. 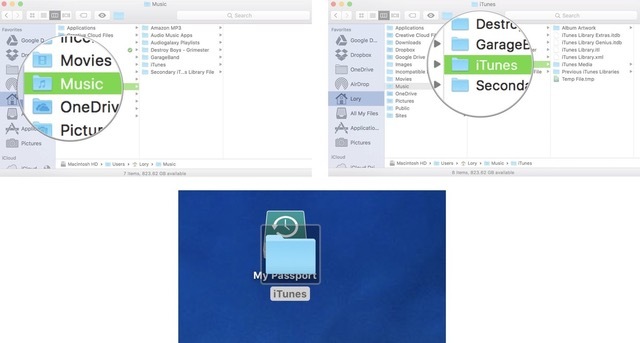 7) Re-launch iTunes and re-connect your iOS devices so iTunes can generate new Lockdown folder files. 1) Unplug all iOS devices from your computer. 2) Close iTunes so it’s not running in the background. 3) Press the Windows key on your keyboard or press Control + Esc at the same time. 4) Click inside of the search field and enter &ProgramData% and press the Enter key. 5) Open the Apple folder by double-clicking on it. 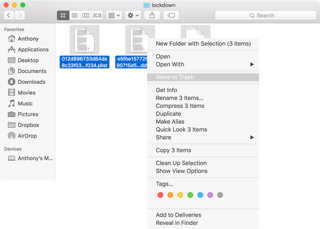 6) Right-click on the folder entitled Lockdown and Delete it. 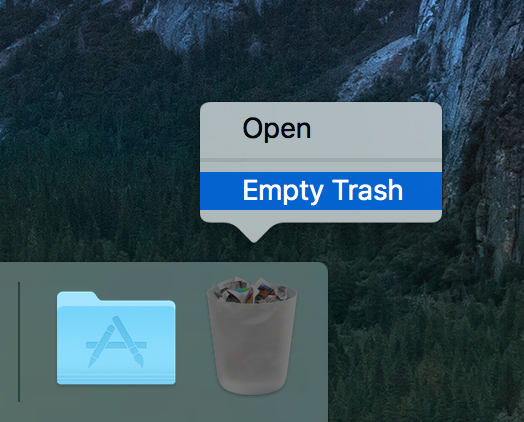 7) Empty your Recycle Bin and restart your computer as well as your iOS devices. Congratulations! You’ve just reset your iTunes Lockdown folder, and hopefully now you can start syncing and backing up your devices with your computer again. All I’ve got to say is iTunes isn’t the absolute best software I’ve ever used, but at least there appear to be ways to fix the problems that can arise. Armed with this troubleshooting information, you can get your device syncing to work again, or even back up your devices if it wasn’t working before. Did resetting your Lockdown folder fix the problem you were having? Share in the comments!